There are more than 1,000 varieties of begonias, stemming from the botanical family Begoniaceae coccinea, which grow in the tropics and sub-tropics of the northern and southern hemispheres. The begonia family includes the fibrous-rooted, wax-leaf, rex, brilliant-leaf, dwarf, spiral-leaf, tuberous root and many others, including the cane type, or angel wing begonias. The angel wing's name comes from the expanse of the leaves, which seem to spread out over the plant like the wings of an angel. Most begonias are grown from what is known as leaf cuttings. At the root of the cuttings, a number of young begonias will begin to grow next to the veins of the leaf. Some will form roots and plantlets of their own, but the replanted flower has to be properly spaced apart and the preferred watering method is overhead irrigation (as from a watering spout) rather than soaking the peat dirt with water. Crowding and overly wet climate conditions may cause an angel wing begonia to develop a fungus called bacterial leaf spot, which causes a "speckling" appearance on the leaves. Also, some of the bugs to watch out for include aphids (soft-bodied insects), mealybugs, mites, caterpillars and fungus gnats, which look like small black flies (see Resources below). If grown outdoors, some will be destroyed in the event of rain torrents, but just be sure to bring them in before frost. Indoors or out, keep them out of direct sunlight. Angel wing begonias can be grown as outdoor annuals or will grow just as nicely indoors in a pot in semi-shade (dimly lit areas). They bloom throughout the month of May all the way through September and come in pink (salmon), red (scarlet), white and orange colors with deep, dark-green hairy leaves, or "wings." They have small and thick cane-like stalks and are not as delicate as they may seem if properly cared for. Demonstrably, begonia wings are lopsided, enlarged on one side and flat on the other. 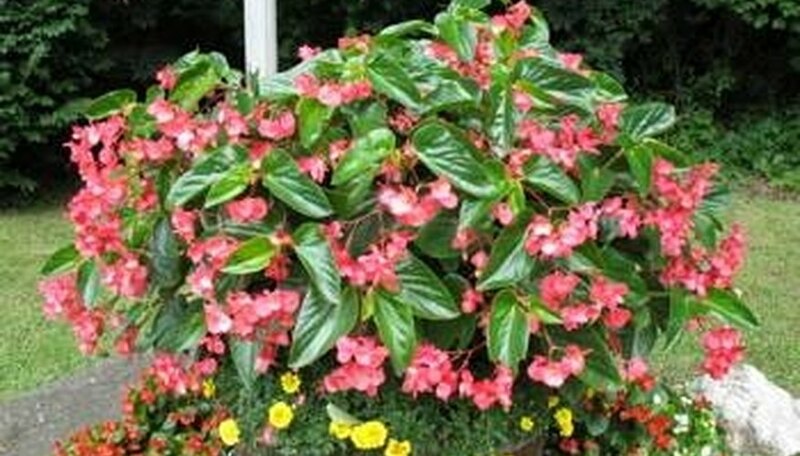 Younger begonias need more phosphorous while they are growing. Older, or more established, plants need to be fertilized at least once a year. An all-purpose fertilizer is good enough. Whether up in a hanging basket or draped across a galvanized wire basket or hustled into a wooden yard bucket, the "beguiling bewitching begonia" can be showcased in demi-light almost year-round except during the cold months, which they don't like. Pinch out the smaller blooms so they can get keep growing, and install a few demure dahlias and petunias in the background. The end result of this kind of landscaping harmony is prom night regalia.